IANS spoke to veteran media professional B.N. Kumar, National President of the Public Relations Council of India (PRCI) and Executive Director of Concept PR, who recently completed 40 years in media-first as a journalist and then a PR practitioner-to focus on the rapidly changing communication trends. A: I don't see anything wrong in journalists looking for information from PR people. It is the PR professionals' job to facilitate the flow of information. And it is for the journalist to check and cross-check whether the information given by PR is right or wrong or a plant-serving a vested interest. This is where, sometimes, I feel that the lines between PR and journalism get blurred when some media friends play into the hands of unscrupulous story-planters. A: In these days of cutthroat competition and race for TRPs, journalists are under constant pressure to score with Breaking News. 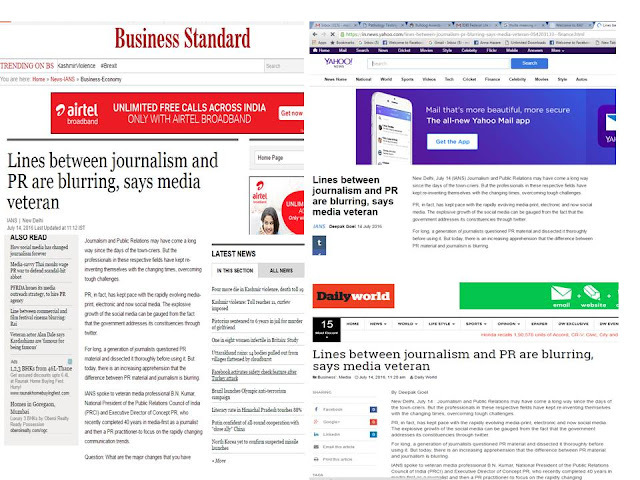 PR professionals often complain that they do not get enough time to respond to media queries and, as a result, one-sided stories often creep in. Also, it is not easy to get negative stories killed. If you try to suppress it in one publication, it will find its way into another media.